To make a Tassel wrap thread around a piece of cardboard a little longer (to allow for trimming) than you want the finished tassel to be…poke a length of thread between the cardboard and wrapped threads and tie the bundle at one end, slip the bundle off the cardboard. 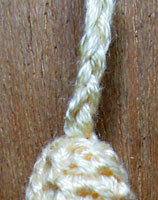 I poked a small ball of batting between the threads at the top to give shape to the top of my tassel. Cut a length of thread about 20 inches long (needs to be long enough to work the buttonhole stitch) and tie one end around the top of the tassel…use a tapestry needle to thread the short end down into the tassel and with the long end buttonhole stitch onto the thread around the tassel and then continue to work into the last row of stitching until top is covered, with the last couple of rows work into every second stitch of the previous row to shape the cover. 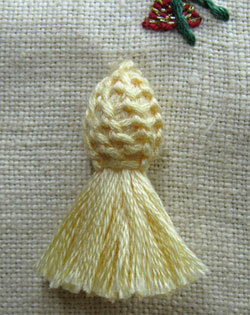 Form a cord by plaiting the 3 threads that are at the top of the tassel. 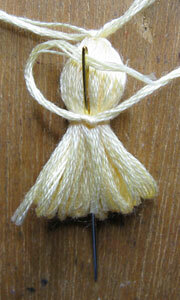 Cut and trim the threads at the bottom of the tassel. My goodness, you always seem to make things look so simple. I would never have even thought to do this. And when I think of the money I’ve spent on tassels…….LOL. 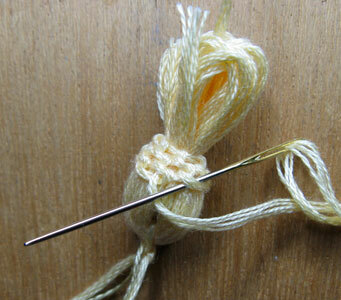 Thank you for this tutorial:-) The tassel’s very nice. I wanted to make some that would look like a thistle – I’ll stitch green on pink, they really look like flowers..
Annie, many thanks for the tutorial. It looks wonderful. I’m going to try it. This is so seriously cool, Annie! I love it… hopefully I can remember it! Enjoyed your Blog, In awe of your beautiful stitches. Do you mind if I copy some for my “Christmas Tree” quilt, its not crazy but pieced but needs beading to sparkle. Oh, thanks for showing how to make these! Beautiful handmade tassel. Thanks or sharing the process. thank you dear for your beatiful handmade tassel. I like it n God Bless U.
Awesum idea. Vll definately try dis tassel soon. Thanks 4 such a beautiful post.